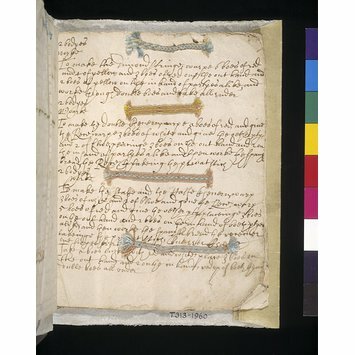 This is one of at least four similar manuscript books that describe how to make purse strings. The author of this one is unknown, but another book, now in the Wigan Archives, was written by Cecilia, Lady Bindloss, a member of a wealthy family in the north of England. Her authorship makes it likely that such books were compiled to be used at home, in the development of the needlework skills that were part of female education, rather than for commercial use. The instructions in the manuscript indicate whether one or two pairs of hands were needed to make the braids. Most of the paragraphs are headed 'one body's work' or 'two body's work'. The 'boes' it specifies in different colours are the loops of silk or metal thread to be wound around and pulled through the fingers to build up the different patterns. These braids are described in the manuscript as purse strings. Most surviving examples take this form, as they have been preserved with the fine embroidered bags and purses to which they were attached. However, the braids would also have had more ephemeral use, for example in dressing the hair and fastening clothing. The first six pages each have sewn in three short lengths of braid worked in coloured silks, with instructions written in ink below explaining how they can be made. The seventh page has just one braid, and the last two pages are blank. A few of the samples include metal thread. 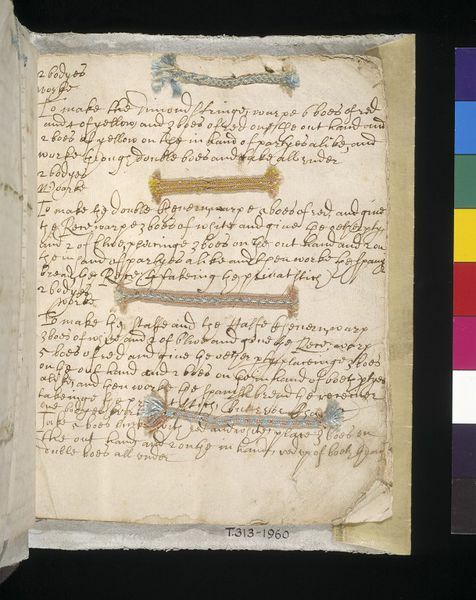 This manuscript was formerly in the collection of Frank Ward. On his death, his 17th century embroideries were bequeathed to the V&A, and his books to the British Museum and the National Library of Wales. The manuscript had been on loan to the V&A between 1927 and 1954, and when Textile Department curators realised it had not come to them with the bequest of embroideries they traced it to the National Library of Wales. The Keeper of Manuscripts there, B C Owens, agreed that it was more appropriate to the V&A's collection, and it was transferred as a gift. The edges of the pages are crumbling, and have been supported at a later date in some places. There is no signature or date. The text of the instructions is transcribed in Anne Dyer's book (see bibliographic reference). Dyer, Anne. Purse Strings Unravelled : a serious look at our loopy ancestors. Westhorpe College, Shropshire, 1997. Arnold, Janet. Queen Elizabeth's Wardrobe Unlocked. W S Maney, Leeds, 1998, pp.219-222. Speiser, Noemi. Old English Pattern Books for Loop Braiding. Published by the author, Switzerland, 2000.